It’s unseasonably chilly outside–the northwest wind at my back lending me a helping hand on the return part of my walk today. Meredith just checked the diary and this day last year–the 12th of May– she and our neighbor Alice collected the first honey from our hive. The bees enjoyed a couple of days working the Judas tree last week–but they’ve retreated again and who knows when they’ll be honey again for tea! Sunday is pasta night and I feel in need of strong flavours. 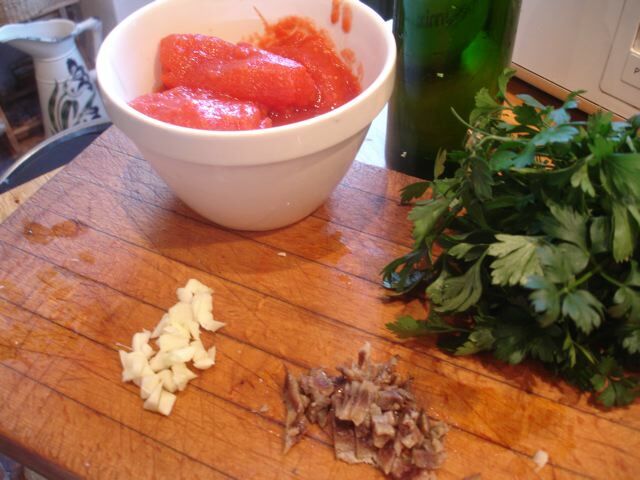 Anchovy and tomato–an old favorite comes to mind. This was first published in October 2011–but it doesn’t feel inappropriate to rerun it this May evening! Meredith and I have eaten this a thousand times. 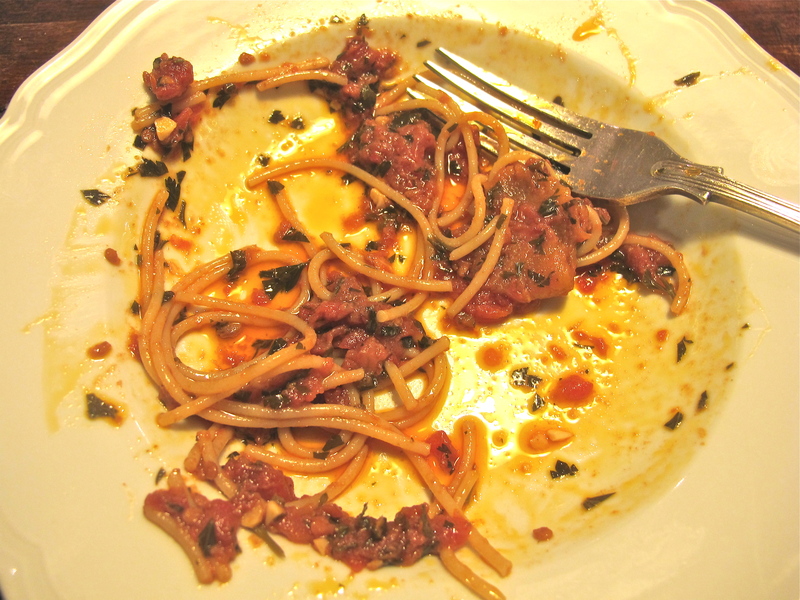 It is from the matchless Marcella Hazan and is probably my favourite pasta dish of all time–comfort food par excellence! What makes it so delicious is the anchovies–controversial little fish–not to everyone’s taste. Here they deepen the taste without dominating. Those preserved in salt are best–they dissolve more readily than those preserved in oil–but it’s a business preparing them for cooking. Since I was diagnosed with type 2 diabetes we have eaten wholewheat pasta and now we prefer it. It’s available on the shelves of most supermarkets these days. How al dente it’s cooked is a matter of taste. In Italy you’d think it was an arrestable offence to overcook pasta–they cook it very al dente and it makes for agreeably slower eating. Lightly sauté the garlic in small saucepan until it colours. Take the pan off the heat and add the anchovies and parsley– stirring well to dissolve them into the oil. Cook at a steady simmer for about 25 minutes, stirring regularly. 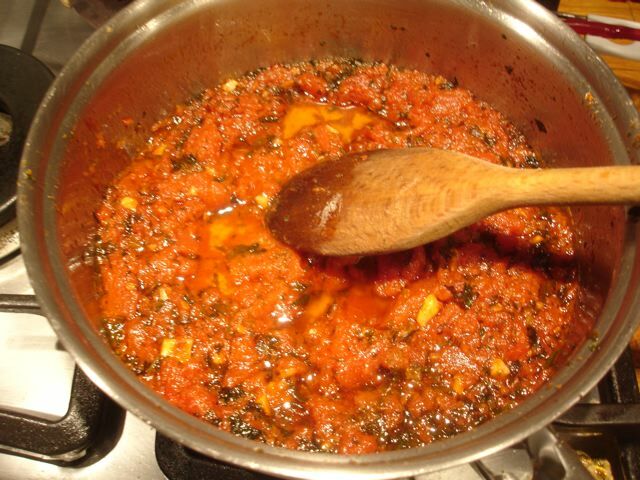 When ready, the sauce will have an unctious consistency and a little pool of oil on top. Cook the spaghettini in plenty of well-salted boiling water. Test for your preferred “doneness”. Drain, put in a heated bowl and add the sauce. That’s sounds absolutely delicious. I love anchovies. Pasta night for us too, but tuna lasagneI should of put some anchovies in buttoo late it’s in the oven. Ohh Yum….I am a celiac, therefore I cannot use the wheat pasta. I must use rice pasta instead. However, this dish will be yummy, I’m sure with the rice pasta substitute. Almost anything with anchovies in it is my sort of meal. Oh dear sorry miss spelt recipe fingers misbehaving again. I like the sound of this recipe. For lazy ‘cooks’ like myself there is a delicious variation. Chop up fresh tomatoes (the sweeter the better, although that is difficult at this time of year) and anchovies (with or without the oil), add some strong olive oil and mix in with the spaghetti. I used anchovies in very piccante oil, so there was really no need to add parsley or whatever, as the taste would have been lost. With less piccante oil garlic would have added something, and I am going to try my favourite herb, oregano, next time, soaking the tomatoes in oil and oregano for a short time beforehand. Quick and simple – and delicious. We might have it tonight, Keith!